The Legal Genealogist is not a morning person. To put it mildly. Generally speaking when I’m up at 5 a.m. it’s because I haven’t been to bed yet. But I had to know… couldn’t wait… would it be, could it be…? As noted in yesterday’s blog, the forensic evidence by itself seemed pretty compelling,1 and Buckley reiterated what was known in the press conference. Contemporary accounts were that Richard’s body had been taken to the Grey Friars friary immediately after the Battle of Bosworth Field in 1485 where his forces lost to those of his successor, Henry VII, and had been hastily buried near the altar. And that’s exactly where the skeleton was found. And the bones were carbon-dated to a period from 1455-1540. Dr. Jo Appleby of the team then explained that the skeleton fitted other known facts about Richard: it was an adult male but with an unusually slender, feminine build. That’s consistent with descriptions of Richard. The bones were of a man in his late 20s or early 30s, and Richard was 32 when he died. The wounds suffered by the person buried were consistent with battle wounds and with reports at the time of how Richard had died. And the man had a serious curvature of the spine (though no withered arm, despite Shakespeare’s descriptions). So, Appleby said, the skeletal evidence provided a “highly convincing case” that this is Richard III. But the absolute nail in the coffin (pun absolutely intended although there actually was no coffin here) was the DNA analysis — something that couldn’t have been done without both good scientific work … and good genealogy. Prof. Kevin Schürer of the University said the team was confident of the genealogical work identifying a Canadian-born furniture maker as a descendant of the Yorkist line, from which Richard also descended. 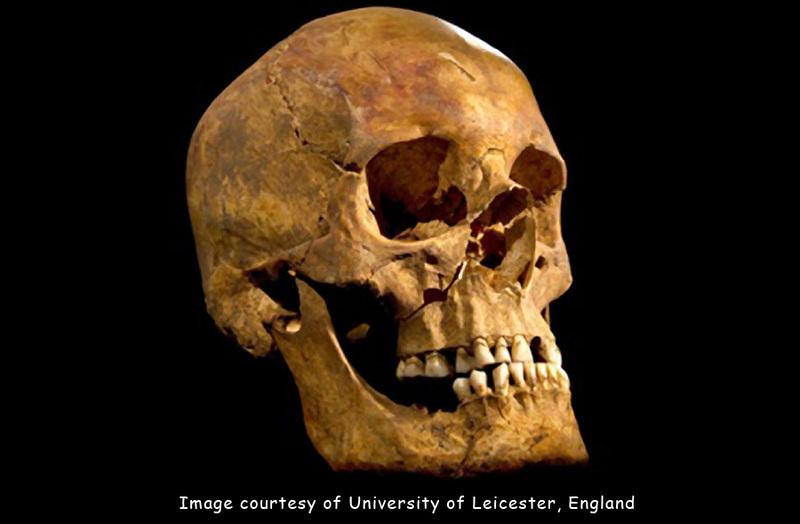 Michael Ibsen was identified as a 17th generation nephew of Richard III in a direct female line of descent so he would have the same mitochondrial DNA as Richard. That means the DNA was passed down over more than 500 years from mother to daughter to daughter to daughter and finally to a son who agreed to be tested. Geneticist Dr. Turi King then spoke and explained that extracting an adequate DNA sample from the remains was difficult but analysis of the sample from the skeleton was possible for comparison against Ibsen’s sample. And, it turns out, genealogists had identified a second man, who’s chosen to remain anonymous, who also descends from Anne of York who also agreed to be tested. And the serendipity of the whole thing? Mitochondrial DNA, the type used for this analysis, the only type that could be used here, is passed by a mother to all of her children, but only a daughter can then pass it on to the next generation.3 So Michael Ibsen and his anonymous distant cousin, the men whose DNA was tested for comparison, can’t pass this type of DNA on to their own children. Neither Michael Ibsen nor his cousin have living female relatives in this line of descent. In other words, one more generation and this result today wouldn’t have been possible. Now just how much more of a reason do we as modern genealogists need to get ourselves and our cousins DNA-tested, I ask you? And just how cool is this whole turn of events? Judy, it may be “genetic” since we are distant cousins, but I am as fascinated by DNA and the story of Richard III as you are! There is an older semi-fictional tale told by mystery writer Josephine Tey that you might enjoy if you’ve never run across it – “The Daughter of Time”. The copy I have is paperback, published by Touchstone. Copyright 1951, renewed 1979 and purchased on Amazon. Richard III’s story told in a more favorable light than usually seen with lots of actual history added, even a family tree diagram. It may well be genetic, Kay! And I love Josephine Tey’s book — shoulda mentioned it yesterday too. This news is very exciting; definitely worth getting up early for! Also, thanks for mentioning the Costain books. They were my favorites too. It was worth it, Carolyn (though I suspect I may not be quite so convinced about three this afternoon when I start to flag). The Costain books are terrific, aren’t they? Sure wish they were more available to readers today. My mama would roll over in her grave if I wore anything other than a yellow rose (for Texas! )… but she sure raised a whole bunch of us as history lovers, Susan. Thank heavens!! Ok, I’ve procrastinated long enough. I just knew it would be! How wonderful that they were able to do this! I sure was hoping, Terri — and boy, wouldn’t it be nice if this spurs an interest in genetic genealogy!?! years ago. The box is long gone but the books remain, and I’m in the middle of rereading “The Three Edwards” for the umptyninth time. I also have a cpy of Paul Kendall’s excellent biography of Richard. descendant. I;m glad they’ve found Richard and can now give him a proper burial. I’m glad your distant cousin will get better treatment now than he did back then, Bill. The DNA stuff here is sure exciting! Whew! It all came together so wonderfully. I love interdisciplinary research, and “success” puts icing on the cake. 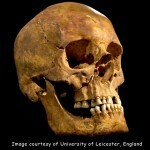 (Did we really think it was NOT Richard III?) Debbie Kennett did a blog as well, and I’m thrilled with all the information, the videos, the research details showing up in blogs, on the Internet news channels. My brother thinks I’m nuts – but I’m with you – this was too exciting not to watch! Cheers to all us history/genealogy nuts!! Debbie did a great job with her blog post. And yeah, we’re all a little nuts with this, but hey… it isn’t every day that DNA solves a 500-year-old mystery! Thank goodness that there wasn’t any cameras running when someone did her “Yes!” dance earlier. Especially at THAT hour of the morning! I don’t even look in the mirror at that hour! This is sooo exciting! I recommend everybody read the book “The Sunne in Splendour” by my favorite author, Sharon Kay Penman, which is about Richard III. I just love that this whole story shines some light on her excellent writing. Solving 500-year-old mysteries through DNA. Hard to beat, isn’t it? 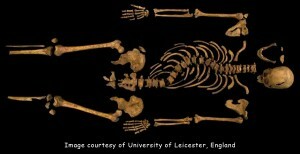 The fact that they were able to get some descendants of Richard III”s family to donate their DNA is really good. It could help those of us that have some reluctant relatives. Especially since people can see that even a member of a famous family can say he wants to be anonymous if he tests, and his privacy will be protected! THIS is a good point, Judy? Just in case the question mark is not a typo… yes, it’s a good thing, because lots of folks out there are absolutely paranoid about the idea of anyone finding out anything about them. I have a cousin I really really wanted to DNA test and he was absolutely adamant about not doing it if he could be identified. With the help of another family member I was able to get him to test, but his test kit is only identified by initials and all contacts come through me. So yes, this really IS a good thing that we can assure people they CAN go the DNA test route for genealogy and they do NOT have to be all concerned about privacy. Based on the following quote from Dr. John Ashdown Hill prior to Feb 4, 2013 I believe this anonymous distant cousin is instead the Canadian mother (now deceased) of Michael Ibsen … Joy Ibsen / Joy M Brown (born 1926 as Muriel Brown and died in 2008 in London, Ontario Canada as a retired journalist) and the team did not have “her” informed consent and hence they scrambled to invent and fabricated this anonymous distant cousin … and if they did indeed do this, what else did they fabricate? He found Joy in 2005. I very well realize that mtDNA evidence in this 500+ year old case is more corroborative than definitive and there was other evidence but I still question who this anonymous J1c2c mtDNA donor is and “when” and “where” this DNA sample was provided to the research team. Besides the DNA sample from the skeleton and that from Michael Ibsen they did need a third sample for DNA Triangulation purposes and I believe that was from Joy. ” They will also be subjected to DNA analysis. The remains will be matched against the DNA of Joy Ibsen, a 16th generation descendant of Anne of York, the sister of Richard III. Mrs Ibsen died four years ago, aged 82. At the site yesterday, Mrs Ibsen’s son Michael, 55, watched as the search began. The furniture-maker, who was born in Canada but now lives in London, said his mother would have been thrilled by the project. Nope, not at all. Dr. Turi King, the geneticist who did the analysis, identified the second person tested as both male and a second cousin of Ibsen’s. Definitely NOT Joy Ibsen. Now is the winter of our content [sic!]. Indeed, it is! You gotta love this — solving a 500-year-old mystery like this! They’ve always known the location of the church…. Why dint they look years ago?? Lots of reasons, because of lots of questions. First, the question was whether in the church at all. Then where in the church. Then why bother since the story was that the bones had been dug up and scattered. That, in fact, is the official version on the monarchy website (“Buried without a monument in Leicester, Richard’s bones were scattered during the English Reformation”). What a fascinating ride leading up to the big discovery! Very cool. Thanks for keeping us in the know, Judy. And to think we were only a generation away from losing that DNA. I saw the chamber where the two little princes were kept in the Tower of London a few years ago, and it’s still a sad and eerie place. Do you think this will help solve the mystery of what happened to them? This by itself won’t, Shelley, but I think everyone who entertains doubts about the story of the princes’ murder (by Richard at least) will be putting pressure on to investigate it more thoroughly and more dispassionately and perhaps shed a little more light and a little less heat on the whole subject. Since he, Richard III, was still king (right?) when he died, will he be accorded a State burial or something passing for a State burial? There aren’t any details yet, Jeff, but given the intense involvement in this whole matter by the Richard III Society I’d be surprised if there isn’t some pomp involved. How much will have to wait for more information. This is a thrilling mystery. I especially like the fact that in one more generation the identification would have been impossible. Suspense, daring experts, and a time threat. It could be a film! That is some remarkable image of Richard’s curvature of the spine. It really is exciting, Mariann, and I agree about the photo: hard to miss THAT curvature!! So if King says there also was a 3rd HE / MALE who provided a DNA Sample … why didn’t they mention the DNA sample provided by Joy … the Mother of Michael? I know attorneys think they have an answer for everything … but is it always the correct one? George, if you want to believe that a team of scientists made up the facts regarding the second sample, you go right ahead. Me, I was raised to believe that when you hear hoofbeats, you think horses, not zebras. Conspiracy theories are rarely my first explanation of choice. I am not asserting that the University Scientist Team “made up the facts”. I am asserting, just as equally wrong as a conspiracy , that they “did not include all of the relevant and important facts” and just “cherry picked the made for the media facts” for their well orchestrated BIG REVEAL press conference on Monday. Reminds me of the Finding Your Roots Big Reveals and dramatic moments. Remember, they want to open up a Richard III Visitors Center; enhance the University reputation; sell some books; sell some Made in China Richard III trinkets; enhance the reputation of Richard III; do some movie deals etc. Take a look at the Ricardian lady who brought this deal to the University and her merry cast. The “Back Stories” are just as good as the “Lead Story” here. And some of those facts are not being heard because of the trove of hoofbeats from unaware and eager reporters & bloggers along with a trove of hoofbeats from naive Genetic Genealogists that do not take the time to fact check and do some critical analysis of their own. This Team did indeed have a viable J1C2C mtDNA sample from Joy Ibsen (died 2008 in Canada) taken sometime between 2005 and 2008. But a dead person does not make good press and perhaps they did not have her informed consent. So, this is a 3rd sample we know they had access to (in addition to that from the skeleton of Richard III) … why didn’t they acknowledge this 1st and earliest DNA sample from Joy Ibsen and the guy who made it happen in 2005, John? Is it about some book deal or movie deal? When you are doing critical forensic type of DNA analysis… do you just willy nilly omit certain results? No – No – No, you don’t and they did. Perhaps an unscrupulous DA or police official might … but now some academics are doing it! Judy, that’s over the top. See the James Lick blog piece here: http://blog.jameslick.com/?m=201302 and also this 2010 book written by a key player in all this: The Last Days of Richard III by John Ashdown-Hill. He had Joy’s test analyzed by Oxford Ancestors and another Lab for verification. John’s also is coming out with a new book and perhaps has a movie deal or documentary deal in the works. And you should, Keith! They’re good reading. The DNA evidence is both exciting and confusing. I would like to see the mtDNA compared to samples in as many databases as possible and see how many other people “match” this rare mtDNA. From my understanding, mtDNA mutates so slowly, that matches can occur and the common maternal ancestor be from 1,000 plus years prior. It would seem natural that the next step is to compare the Y-DNA from the skeleton with the Y-DNA from the nephews. Not much chance of getting that comparison with the nephews, Frances. Two reasons: (1) there’s one heck of a debate about when, where and how the princes died and where they might be buried and (2) the officially recognized burial site is at Westminster Abbey and officials there say (loosely translated) no, no, hell no, and forget it. Oh, to be in England… maybe someday I can find some Sherwood relatives to match my Thomas (came on the Francis of Ipswich in 1634) he might be from Kettlebaston… would it be possible to now use this advanced testing on the remains of the King Edward V and his brother Richard? Fascinating! There are some problems with testing the princes, Susan. (a) Nobody’s quite sure that the remains in the urn at Westminster are theirs. (b) Westminster says no way, Jose, no testing. According to 23andme, a DNA testing lab, I have the maternal haploid group J1c2c, the same as Richard 3rd and Michael Ibsen. Does anyone know how to find out how I could be related? The best information I’m aware of is what James Lick wrote here. See also the info at this Wikipedia article. I’m curious (and confused). Why didn’t they test the mtDNA from Michael Ibsen’s SISTER (he mentioned he has a sister and brother in an interview)? If she has children, especially daughters, there would be continuous mtDNA descendants. Anyone check his sister? They didn’t need to test the sister: all of a mother’s children will share the same mtDNA (and only her mtDNA, not their father’s). That’s a quirk of how mtDNA is handed down: by a mother to all of her children, male and female, but only the females can pass it on to their children.